To reach this cemetery from Collinwood, Tennessee, travel south on Tennessee highway 13 for 4 miles, Turn right off of highway 13 and left (south) onto the Natchez Trace Parkway. Go about 2 miles and turn right onto Big Cypress Road. Go past Scotts Chapel Free Will Baptist Church and continue for 2.1 miles. The cemetery is on the left side of the road near the intersection of Big Cypress Road & J.B. Pigg Road. 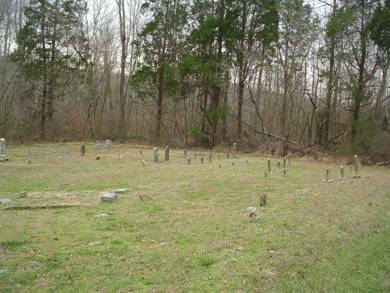 This cemetery is in south/central Wayne County, Tennessee just off the Natchez Trace Parkway on Big Cypress Road. There are at least 16 graves in this cemetery marked only by fieldstones. Berry, Callie; b. 31 Mar 1900, d. 31 Apr 1900, daughter of J.E. & A.E. Berry, David H.; b. 30 Aug 1916, d. 26 Nov 1916, son of D.G. and M.J.
Berry, Elsie; b. 28 Nov 1899, d. 04 Sep 1901, daughter. of D.C. and Mary. Berry, Hattie; b. 08 Jan 1895, d. 17 Aug 1908, daughter of J.E. & A.E. Berry, John; b. 16 Sep 1831, d. 04 Sep 1895. Berry, Lee (Ducket); b. 08 Oct 1901, d. 14 Oct 1905, son of J.E. and A.E. Berry, Susan H.; b. 26 Feb 1829, d. 09 Jan 1920. Berry, Tommie; b. 07 Aug 1894, d. 21 Nov 1894, son of J.E. & A.E. Berry, Willie H.; b. 14 June 1889, d. 17 Oct 1890, son of J.E. & A.E. Davis, Mary J.; b. 04 May 1843, d. 24 Jan 1897, wife of C.W. Harlow, Geams M.; b. 20 Oct 1879, d. 10 Jan 1880, son of W.T. & M.
Harlow, William. T.; b. 07 Jun 1875, d. 05 Sep 1875, son of W. T. and M.
Lawson, James A.; b. 31 July 1864, d. 02 Nov 1893. Lawson, Martha J.; b. 06 Sep 1861, d. 25 Nov 1879, daughter of T.J. and Rachal. Lawson, Thomas J.; b. 27 June 1866, d. 17 Oct 1876, son of T.J. and Rachal. Lawson, W. T.; b. 04 Oct 1884, d. 22 Oct 1884. Moore, Addie Pearl; b. 23 Dec 1890, d. 20 May 1896. McFalls, Mary E.; b. 15 Nov 1855, d. 28 Nov 1887, daughter of T. J. and Rachal Lawson, wife of Pue McFalls. Newton, Jasper; no dates, 3 years old at death, son of J.H. & L.J. Pigg, Delaware; b. Feb 1884, d. 21 Jan 1932, son of Mary J. & W.M. Pigg, James; b. 18 Dec 1873, d. 21 Sep 1874. Pigg, Jasper; b. 22 Aug 1862, d. 18 Feb 1906, husband of E.C. Pigg, John H.; b. 10 Feb 1864, d. 03 Mar 1888. Pigg, Mary J.; b. 23 Dec 1842, d. 24 Sep 1907, wife of W.M. Pigg, William “Bill”; b. Mar 17 1842, d. 22 Feb 1888. Rich, Harve; b. 04 Dec 1866, d. 02 June 1945. Rich, J. T.; b. 12 Feb 1861, d. 08 Mar 1937, husband of S.J. Rich, Lonnie; b. 21 May 1898, d. 21 Dec 1919. Rich, Mattie; b. 19 Aug 1873, d. 07 Apr 1944. Rich, Mollie B.; b. 12 Sep 1892, d. 12 June 1919. Rich, S. J.; b. 16 Jun 1859, d. 29 Mar 1932, wife of J.T. Rich, Sarah; b. 28 Mar 1837, d. 28 Feb 1912. Rich, W. F.; b. 04 Oct 1836, d. 16 July 1919.